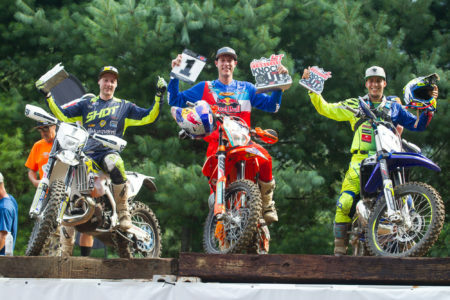 FMF KTM Factory Racing-backed Cody Webb (@codywebb2) withstood a heavy international assault from the UK’s Graham Jarvis (@gforcejarvis) and Spain’s Mario Roman (@marioroman74) to take his fifth straight Kenda AMA Tennessee Knockout win. The American was once again unstoppable on the tough terrain at the Trials Training Center, winning all four rounds despite intense pressure from Rockstar Husqvarna’s Jarvis. 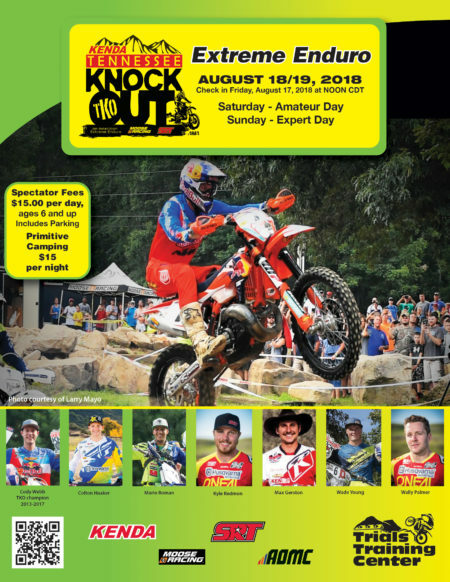 The multi-round Tennessee Knockout started with 250 Amateur entries competing on Saturday in a two-race format that allowed the top thirty riders to move forward to compete in the four round Sunday competition that included twenty nine pre-qualified pro riders from around the world. 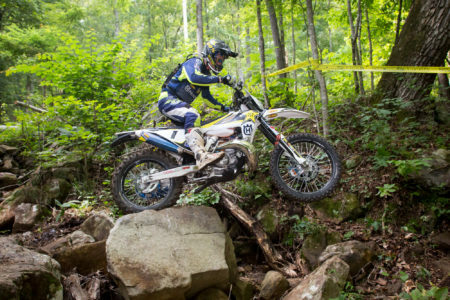 Jarrett Mohn topped the Amateur competition to earn the AMA Amateur Extreme Enduro Grand National Championship and move forward to Sunday. The Sunday morning program started with a Hot Lap on a mile long “short course” and Webb started the day off with a 3:53 lap to earn the first starting position for the next Knockout round. Sherco’s Ramon proved a quick learner to set the second fastest time at 4:15. SRT Offroad backed Kyle Redmond was third fastest at 4:17. Jarvis was fourth at 4:18 and SRT backed Cory Graffunder fifth at 4:39. 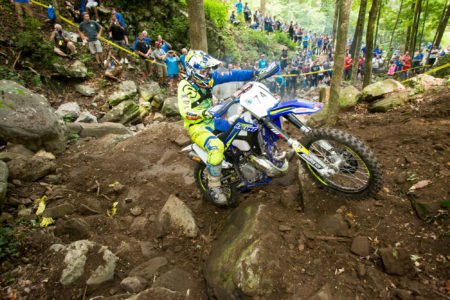 The second round sent the riders out on a fourteen-mile loop in thirty second intervals and Webb was again fastest with a 1:10:28 lap. Roman continued to impress with the second fastest time at 1:14:30 and Beta USA’s Jordan Ashburn (@jashburn7), who is a Tennessee native, was third with a 1:16:16. Jarvis (1:16:25) and Graffunder (1:21:52) rounded out the top five. Fifty-six riders started this round and only the fastest 25 riders moved on to the next Knockout. Round three, switched from the riders hitting the track by themselves to a multi-rider head-to-head format. The fastest twenty five riders were split into five groups of five but before that, one last rider was added to the mix in a one-on-one elimination straight line dual between the 26th to 29th place riders. Chuck Dulullo earned that final spot to join group five. Webb, Roman, Ashburn, Jarvis, and Graffunder won their respective groups to earn front row starting positions. 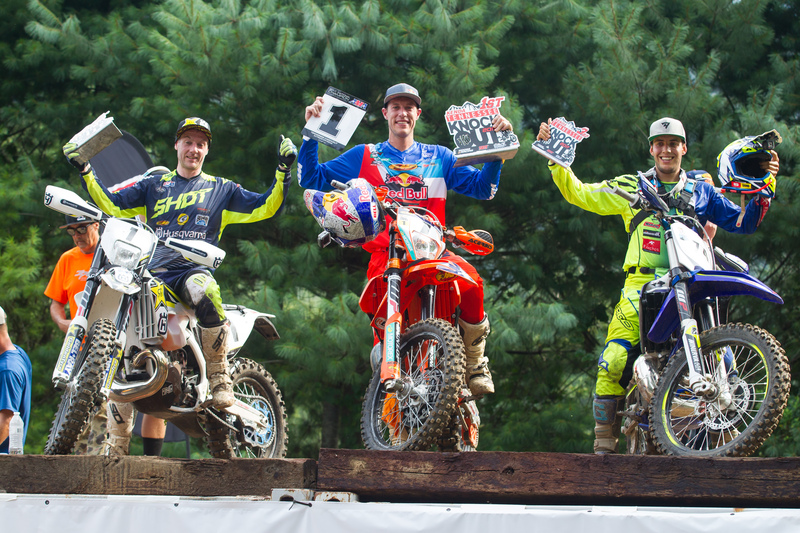 The second and third place finishers in each group also moved on to the fifteen rider main event. 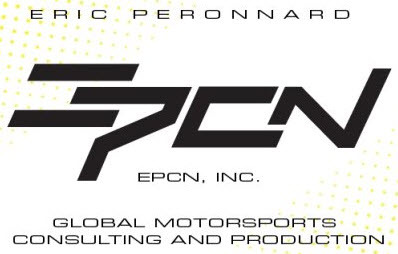 The main event moved back to the short course and would be a 30-minute plus one lap battle. Webb quickly moved into the lead followed closely by Jarvis and Roman and those three opened a large gap on the first lap. Roman then got stuck in the notoriously tough water fall that had stopped many of the other riders on lap one. Jarvis kept the pressure on Webb and even managed to take the lead for a second or two a few times only to quickly lose it back. This went on for six laps in what turned out to be an eight lap race. 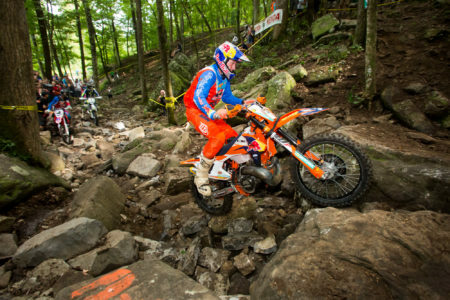 Then Webb managed to open a small gap and squeeze by a few stuck riders while Jarvis took a more cautious wait and see approach that ultimately allowed Webb to extend the gap. Webb took the win after nearly forty minutes of racing while Jarvis finished a little over two minutes back. Webb lapped Roman on the last lap but the Spaniard managed to hold on for third position. Beta’s Max Gerston (@maxgerston) had a pretty quiet day but managed to pass his teammate Ashburn on the last lap to take fourth. Ashburn was right in the battle for third with Roman for most of the race but a few mistakes in the closing laps cost him two spots and he ultimately finished fifth. Graffunder, Ben Kelly, Mitch Carvolth, Quinn Wentzel and Grayson Gonsalves rounded out the top ten. Gonsalves had made the long trip from Hawaii to compete in the Amateur day and advanced into Sunday so his top ten was an impressive result. Fellow Hawaiian’s Kealoha Estrella (11th) and Chris Satterfield (15th) also made the main event proving that the Aloha state residents know how to ride the tough stuff. Beta’s Morgan Tanke (@mtanke31) took the Saturday Women’s class win over Victoria Harcy. They were the only two female riders that finished the morning lap and faced off in a main event on a special short course. Keep an eye on this blog for a video recap within a few days. 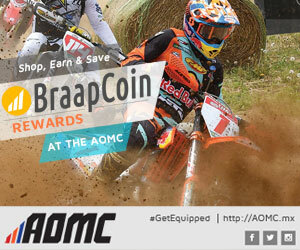 Complete results for all competitors for all races on both days can be found here.